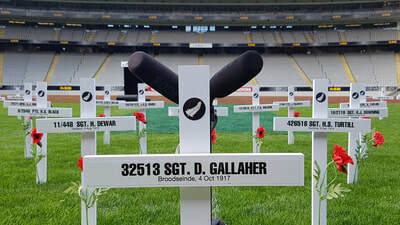 Dave Gallaher, captain of the 1905 All Blacks Originals, died 100 years ago in the WWI battle at Broodseinde and Passchendaele. 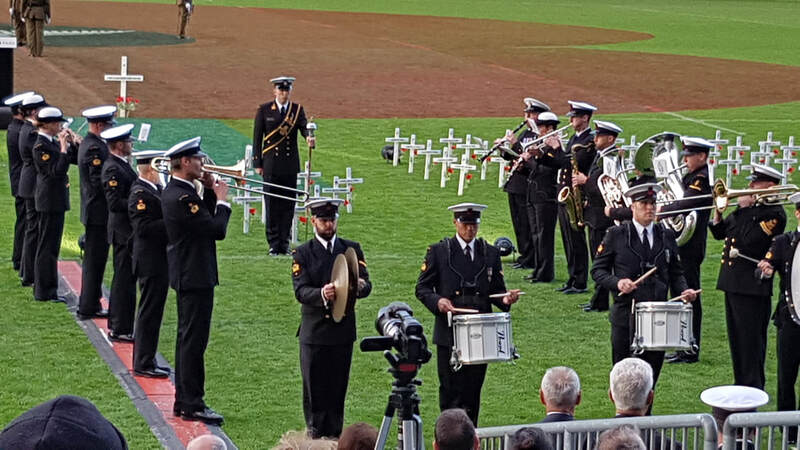 I went along with Bernie Ward to the commemoration at Eden Park on 4th October. The “Mates on the Field” event was an incredible fusion of our national passion for rugby and our reverence for our ANZAC history. 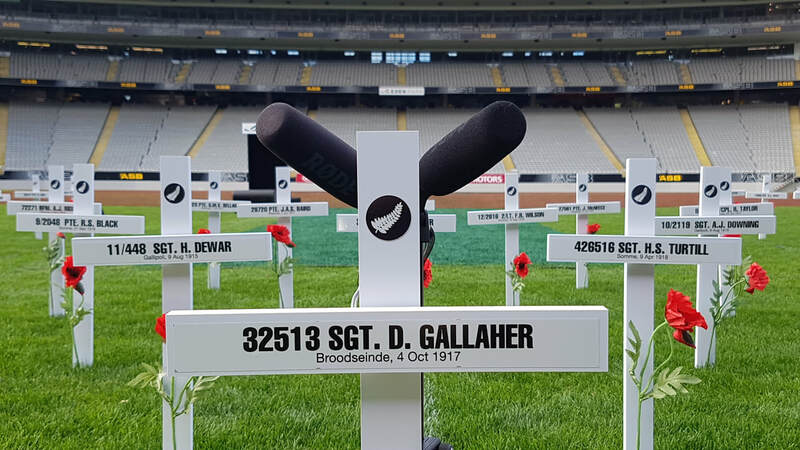 Dave Gallaher was one of 13 All Blacks killed during WWI. 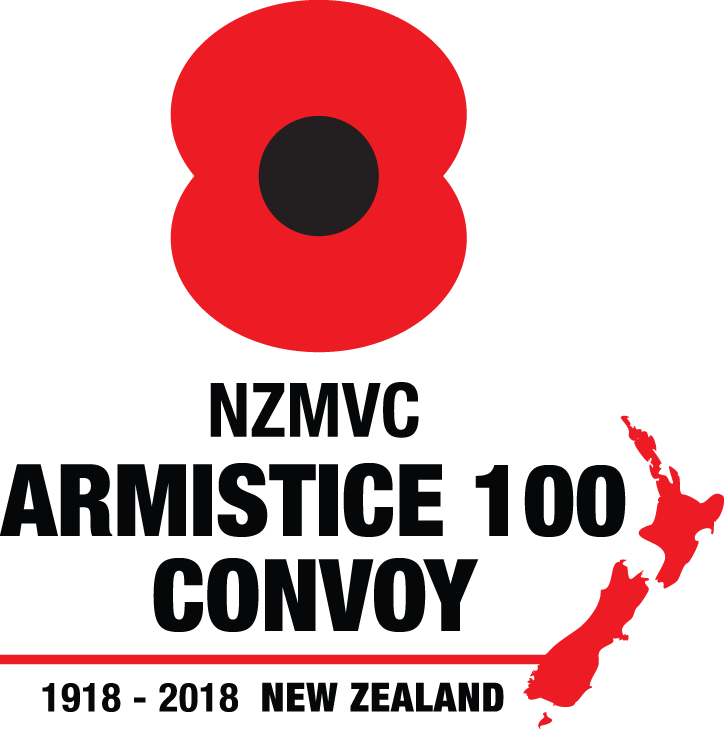 The others were Albert Downing, Henry Dewar (Gallipoli, 1915), Frank Wilson, Robert Black (Somme, 1916), George Seller, James Baird, Reginald Taylor, James McNeece (Messines, 1917), Hubert Turtill, Ernest Dodd, Alex Ridland (Somme, 1918) and Eric Harper (Palestine, 1918). 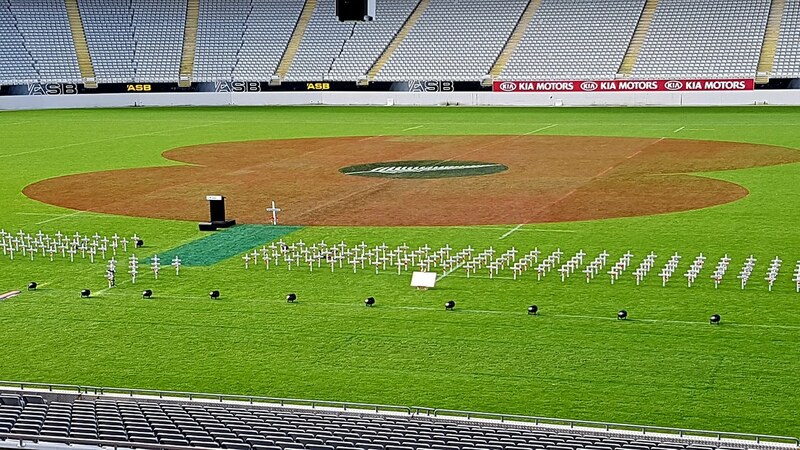 A huge poppy was painted onto the Eden Park turf (the groundsman was not happy!) 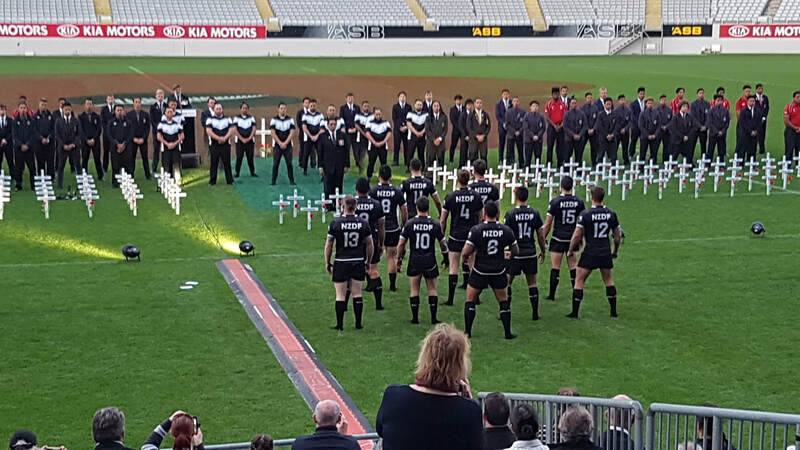 and 492 personalised crosses were set out on the field representing every New Zealander killed on that terrible morning on 4 October 1917. 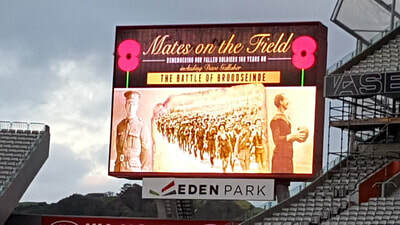 I stepped boldly out onto the hallowed turf to get some photos. The Turf Police were distracted somewhere else. As the service at dusk played out, the names of the dead scrolled across the side screens. I wondered if the Ashton noted was related to our local member. 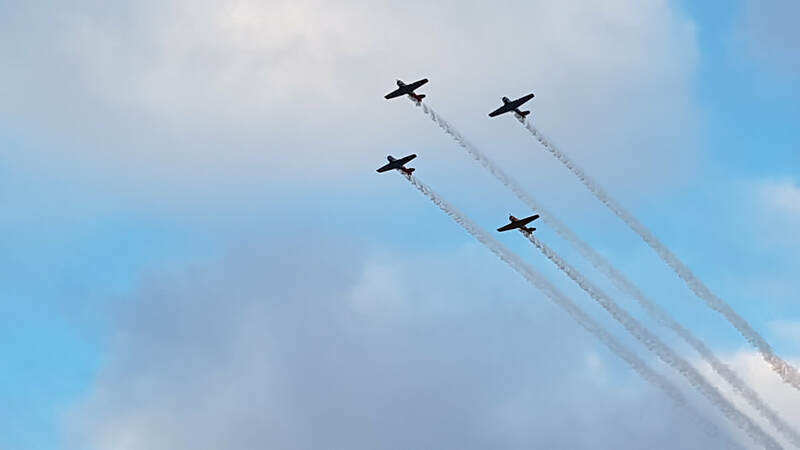 Graphics were on the jumbo screens, and a formation of Harvard aircraft flew over us. 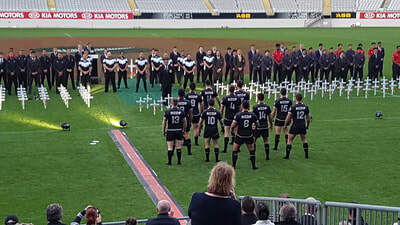 As the Last Post played, the New Zealand flag and the Belgian flag were lowered from the Eden Park goal posts – the first time that any country’s flags have flown from this rugby altar. The Navy Band marched up and down as they played. 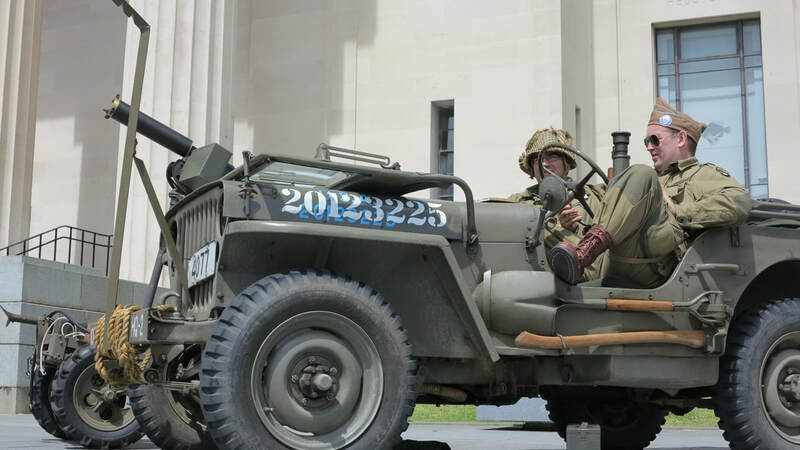 Later in October, I took my 1940 Dodge to Auckland Museum to display for the annual Military History Day. We had 9 vehicles and a MG handcart there. We shared fond memories of Grizz Yates using a Champaign bucket as a drip tray. We laughed yet again of the memory of him trying to clean oil off the sacred marble paving with what he thought was brake degreaser but was in fact green enamel paint in a spray can. Ah, the smell of petrol desperately washing paint off marble in the morning! The day progressed well, even though there was a strong wind blowing. We were reasonably sheltered in the lee of the Museum. Inside the Atrium various other military history groups had display tables. 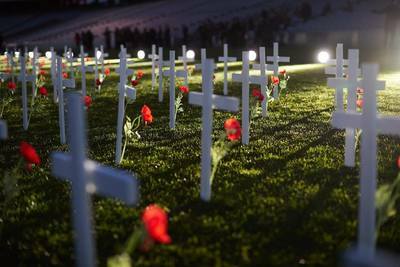 Fields of Remembrance had placed 2,412 personalised white crosses below the Museum. That was the toll in the Passchendaele offensive from 31 July to 10 November 1917. 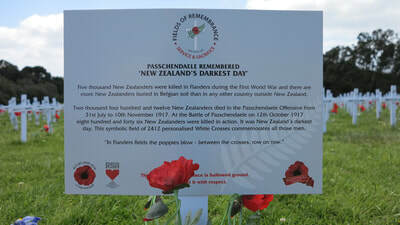 More New Zealanders are buried in Belgium than in any other overseas country. Of all the pointless wars, WWI was more pointless than most. The imperial face-off killed and damaged millions of people. It was not unusual for several brothers in one family to be killed. 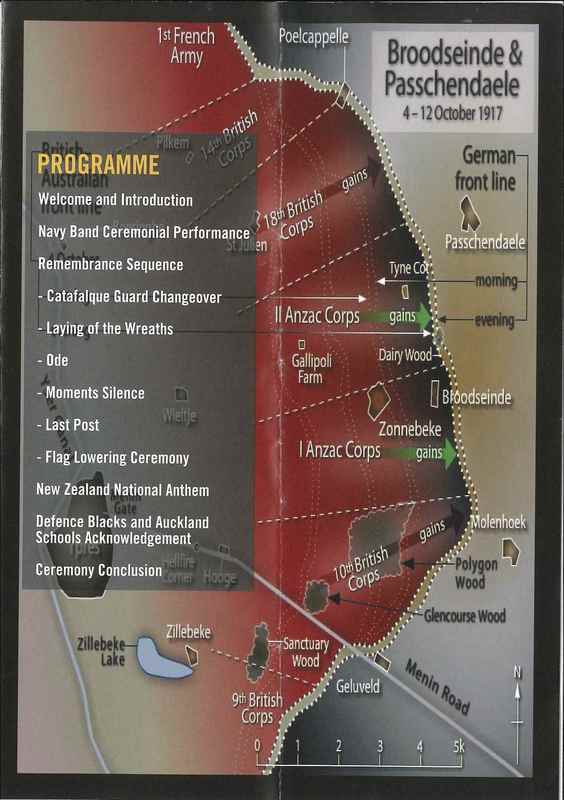 World War I reaches out over the decades and still grabs our attention. The harsh reparations imposed on Germany led to the eventual rise to power of WWI veteran Adolf Hitler. After WWII, the USA imposed a political system on Germany to ensure that no single political party would ever have absolute control again. That system, MMP, is now controlling the New Zealand political landscape, and led to a period of uncertainty this October during the commemorations.